Amir calls Zara and says soon I will prove that I didnt send that message. She ends call. Kabir comes there and tells Zara they are calling her downstairs and dont say anything wrong. Zara greets everyone. Anas asks why she is miffed with him? She says no I am not. Alina gets emotional. Anas’s mom asks if she is happy? Ayesha says she is happy, nobody is against this relation. Ayesha asks Zara to sit with Alina and let them know how happy are you. Zara nods and says I decided to stay silent but what is happening here? Islam doesnt allow us to force girls to marry, you want me to lie? but my husband made me learn to never lie, did anyone ask Alina about her happiness? if she agrees with it? this is not God’s path. Kabir says to Asad that we didnt force Alina, she agreed to it and her parents are taking decision for her and Alina said yes as well. Zara says lets ask Alina. Kabir says yes ask her, he asks Alina what is truth here? Alina says I accept this proposal. Zara is disappointed. Alina recalls Zeenat’s words that Ayesha will throw Zara out of house. Alina says I will never go against family and will marry Anas only. Ayesha says everything is fine. Kabir makes Alina eat sweets. In house, Zeenat asks Zara what do you want? Ayesha says you think we are against our daughter? I always stood by you and now you are doing this? Zara says its about Alina’s happiness. Ayesha says Amir cant give Alina what Anas can, he cant give her good life. Zara says think about love, you people have forced her and kept pushing her emotionally. Kabir gets call from agent and says that number messaged Alina? Man says yes. Kabir gets angry. Zara hugs Ayesha and says Alina didnt agree from heart, you forced her and she will live life under burden and you all will be responsible. Zeenat says you are doing all this for your gain. Zara says dont show fake concern for Alina, you messaged Alina as Amir. Kabir comes there and says you are lying, you sent that message, all are stunned. Flashback shows how Zeenat went to Zara’s room and took her ID to use. Zara asks Kabir what are you saying? Kabir says sim was registered on your name. Zara says I heard Zeenat saying that she messaged. Zara gets call from Amir. Kabir takes call. Amir says sim is registered on your name. Kabir ends call. Zara thinks this is Zeenat’s trick. Kabir says to Zara that how could you do this? Zara says I didnt do it. Kabir says you keep lying, you made my sister run from house, why? Zeenat asks Ayesha to not stay silent, throw her out of house. Kashan says she crossed all limits, she doesnt want our sister to have a good life, Zeenat says throw her out. Ayesha says to Zara that enough, I cant bear you in this house anymore. She tries to take her but Kabir stops her. Ayesha leaves Zara’s hand. Kabir holds Zara’s hand and smiles. He takes her to door and makes her stand outside. Zeenat thinks that now I dont have any hurdle in my success. Kabir leaves from there. Zara cries and turns away from house. PRECAP- Kabir calls Amir and says tomorrow is Alina’s nikah so you have to submit divorce application. Zara calls Amir and tells him to not submit that application. Zeenat says to Kashan that tomorrow drama will happen. 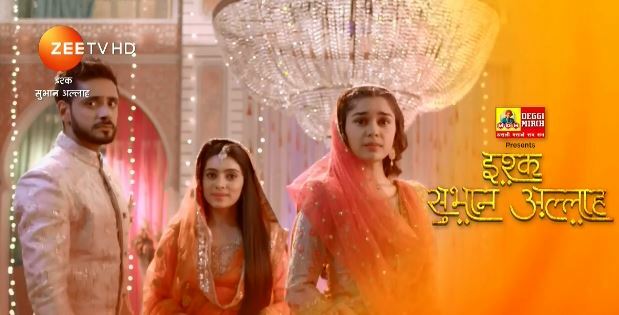 The post Ishq Subhan Allah 26th February 2019 Written Episode Update: Kabir throws Zara out of house appeared first on Telly Updates.